For Lasker Year 2018, the German manufacturer MILLENNIUM in cooperation with the German Chess Federation has designed a special chess computer and produced in a limited edition, on the occasion of the 150th birthday of the only German chess world champion. 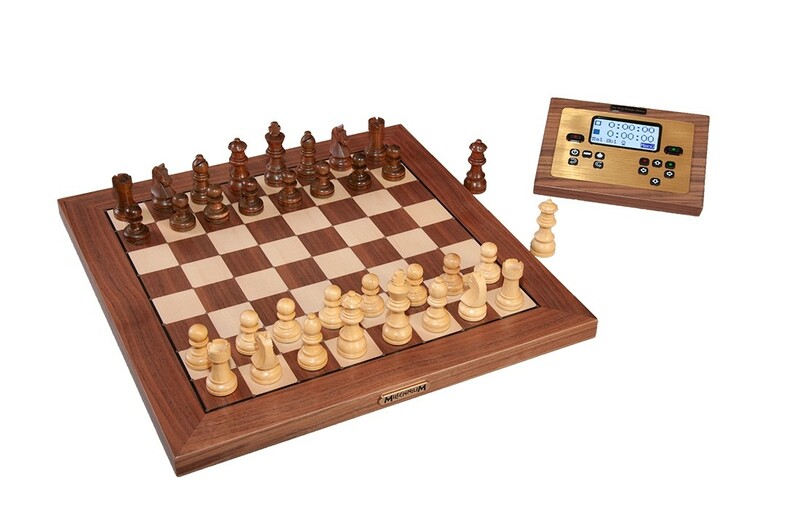 Included in delivery is a special issue of the Emanuel Lasker Company, plus the Exclusive Chessboard with figure recognition and the new control module with the world-famous The King software. Get ChessLink and enjoy expanded connectivity of your ChessGenius Exclusive by integrating tablet, PC, and other devices. Millennium originally introduced the beautiful wood cabinet ChessGenius Exclusive Chess Computer with expansion in mind for upgrades and new features. ChessLink connects Exclusive's already strong play experience, including autosensory piece recognition, to various devices via Bluetooth or USB. You'll be able to access powerful engines for analysis and online play. For example, on IPhone and iPad, the app "Hiarcs Chess Explorer" by Mark Uniacke which offers, among other things, an adaptive game strength with display of the ELO value of the player. It reaches over 3000 ELO. On Android devices, the app "Chess for Android" by Aart Bik has the ability to load UCI engines with future online play coming. A powerful PC software is also in production. That's just the beginning of how you can combine ChessLink with Exclusive and chart new territory with your chess experience!